Dr. Nancy Yousef has obtained her D.D.S degree from New York University, College of Dentistry in New York, NY. The NYUCD is global leader in the forefront of Dentistry. She graduated among the top 20% of her class. 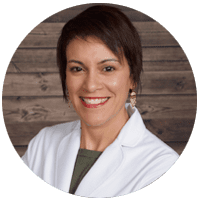 Dr. Yousef prides herself on her comprehensive approach. She brings a high level of compassion to her treatment of patients. She is an expert in treating dental-phobic patients and clearly explains to them the procedures to be used. Dr. Yousef reside in Georgetown, TX. She has moved to the Central Texas area with her family 4 years ago. She is an avid learner and reader on all things dentistry. In her spare times she enjoys crocheting, sewing, reading, and music.